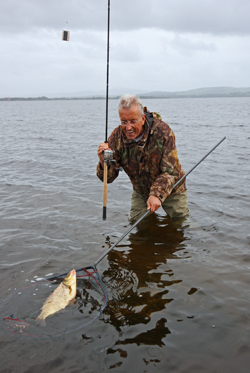 “What would it take to tempt you to come over and fish Lough Derg?” Said the email. “I suppose an invitation would be a good starting point!” Was my reply. Lorraine Tully rents out three fabulous properties on the shores of Lough Derg, near Whitegates, in Ireland’s Shannon Region, a location I’d previously visited nine years ago. The properties are substantially proportioned. The one we stayed in had three bedrooms, two of which were en-suite and there was a third family bathroom. The kitchen was about 20 feet square, can you believe? The lounge is of a good size, too, and it comes with a log/ peat burner which is great for atmosphere although totally unnecessary after the first evening as the central heating kept everything really toasty. Oh, and the TV has about 300 satellite channels so you’ll not want for something to watch on the box if you’re bored. Outside there’s a good sized lockable tackle shed and you have your own bait fridge, too. Cross the lawns and you’ll find your own boat moored in a sheltered bay. Now let’s be in no doubt, Lough Derg is big. Hang on, better make that MASSIVE. It’s over 40 km long by more than 11 km at its widest point. That’s over 32,000 acres of water running to 36 metres deep. 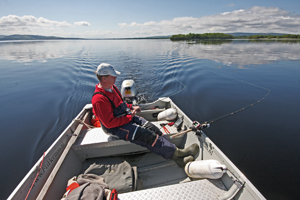 The River Shannon flows in at the northern end (Portumna) and out again at the Southern tip (Killaloe) yet with the exception of pike anglers, very little coarse angling takes place. In a whole days trolling I spotted just two anglers fishing from the bank. It led me to wonder when had I last fished for truly wild fish. Carp? No chance! English barbel? Give over…! This was something else. 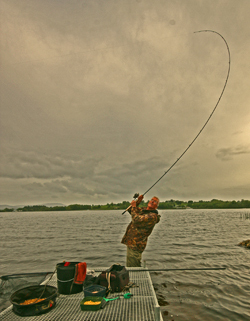 There are vast shoals of fish in Lough Derg that have never seen a hook nor ever will. Back in 2002 I dropped into TJ O’Brien’s tackle shop in Killaloe and he refused to take payment for a couple of tubs of split shot. 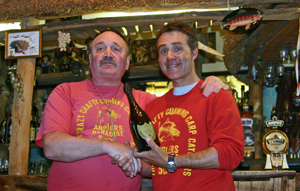 It was a small but genuine gesture of friendship that left me feeling that one day I would have to go back and return the favour, so it would have been rude not to make contact and organise a day’s fishing together on this trip. 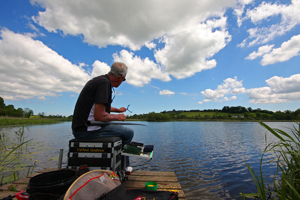 TJ keeps a number of swims baited out on the Lough that are only accessible by boat. It means he can pretty much guarantee to put his guests on a few fish and some truly massive catches are made. 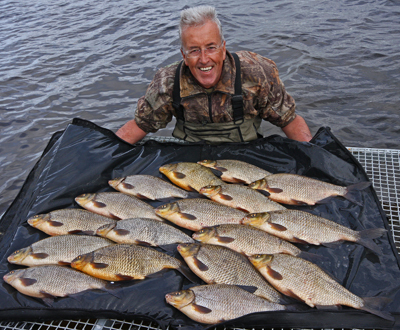 Hundred pound bags of bream are nothing exceptional if you know what you’re doing. Two hundred pounds barely raises an eyebrow. 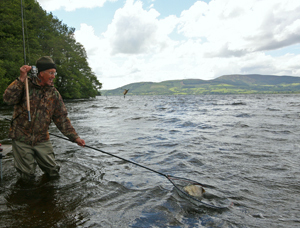 I met up with TJ on Monday morning and we shot across the Lough in his high-powered boat to his first pre-baited swim. There was a bit of a chop on but nothing untoward. Simple groundbait feeder tactics were the order of the day, casting out between two markers spaced maybe 50 metres apart. The key is to get into a regular casting rhythm and try to keep everything accurate. With no carp to worry about it’s perfectly safe to clip up at the required distance. That way you shouldn’t under or overcast. Sadly, two hours in, no-one had raised a bite and the weather was visibly deteriorating. White horses had already begun crashing onto our shore when TJ decided to go and investigate a second swim he’d baited on the far side of the Lough where conditions would be much calmer. I soldiered on and then, right out of the blue, I had a bite which produced a cracking hybrid, nearer 3lb than two, and boy, do these beauties fight well. Next cast I had another, then a bream. Things were certainly looking up but in the distance I could see the plumes of spray from TJ’s boat as it tracked back across the turbulent waters. The bad news was that we’d better pack in and head for the sheltered bank as the Lough was cutting up rough and could turn dangerous. The good news was that TJ had caught 2 bream while checking out the swims and we hadn’t yet reached the key feeding time. John (Walsh) and I didn’t take any persuading. 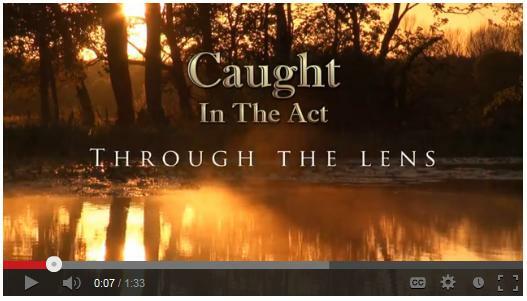 Fishing from the far bank was like being in a different world. Evening sunshine warmed our shoulders, the wind deflected by trees and hills just provided a nice ripple and I could think of no place I’d rather have been fishing at that moment. After barely 5 minutes my quiver tip pulled gently round and a sweeping strike was met the thump of a heavy fish. It was a slab of around 5lb. From then on we all caught bream steadily until it was time to pack up. It was easy to see why big weights are on the cards. With fish averaging 5lbs or more, and let’s not forget that seven, 8 and even 9lb fish can turn up, it takes less than 20 fish to make a ‘ton’. Plenty of feed is needed though as these shoals are massive and I doubt you could actually stop them for very long. They just move in, hoover everything up and move on, looking for more. This is perhaps an ideal opportunity to mention how I was fishing. I was using a light quiver tip rod and a reel loaded with 6lb line. In reality I could have done with a slightly heavier rod but I’d lent that to John and matched it with 8lb line as he’s a bit of a novice and it would make things easier for him. Because of this, and taking into account the wind strength, I was fishing at my casting limit and really having to punch the feeder. So next time it would be a medium power quiver rod. I made a stupid mistake taking a load of cage feeders rather than standard open ended ones. There are some awkward rocky drop-offs on Derg that will punish you if the feeder drops as you reel in. A simple open-ended feeder rises quicker in the water and feeder losses would have been fewer. Little things like that sound obvious when you return home. Doh! I generally used 3 or 4lb hook links, although I doubt that 5lb would have reduced the number of bites. The links were around 3 feet long and attached using a 4-turn water knot. Hooks were either size 12 or 14 depending on whether I wanted to use worm or maggots on the hook. 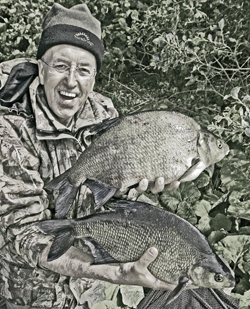 Most folk travelling to Ireland will pick up a sack of brown crumb while they are over there but because I was only likely to fish for bream on two occasions I stuck with the tried and tested Bag Em Pro Competition groundbaits. A tip here is that I like to add a proportion of method mix to the stuff I intend to fire out with a catapult as this holds it together well but will break down in the water. Bait wise I took two gallons of maggots. The first gallon (of whites) was picked up a week before the trip and kept in a really cold fridge. I knew that they would start to turn as soon as I got over there and each day I was able to riddle off a pint or two of fresh casters. The second gallon (whites and reds) was picked up the day before we left home. If transporting maggots is likely to cause you a problem you can order them from TJ’s Angling Centre and other Irish tackle shops. In addition to the ‘live’ baits I took along a few kilos of 3mm halibut pellets as I have great faith in these as a bream attractor and holding bait. On top of this I had a few worms and some corn. Worm is the key bait if the bream move in – double Dendra was TJ’s favourite but sweetcorn is a great ‘sight’ bait for pulling in the fish. It was with a heavy heart that I had to pack up that evening but TJ, who’s a quiet man of few words until you get to know him, had opened up and begun to tell me of his passion for travel and foreign adventure fishing. 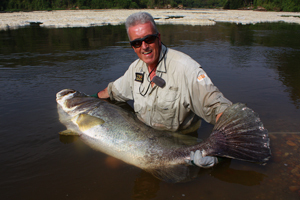 Turns out he too had fished for mahseer with Misty Dillon and the Himalayan Outback company. He’d also fished in the Andamans. It’s a small world, eh? We rested the following day and went to Limerick. 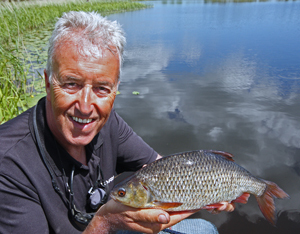 On Wednesday I’d invited Shane O’Reilly, who works for Inland Fisheries Ireland, to join me. Originally we were going to fish the Shannon but I’d been steadily introducing a bit of feed into a swim barely 600 metres from the cottage, just off an island, so it seemed a shame not to give it a try. 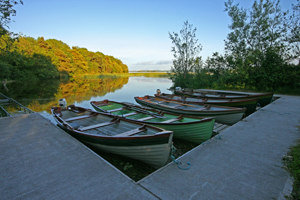 Fortunately Lorraine’s cottages have a landing dock with boats available making baiting-up and fishing dead easy. Indeed there are two permanent fishing stands off the island so the fish are used to finding anglers’ baits in the area. I’d been nipping out in the boat each evening and morning from when we arrived to scatter some casters, maggots, pellets, corn and groundbait in the same spot. To make sure I did this accurately I rigged up a marker using some 12lb line, a good sized rock and a small plastic pop bottle and placed this 5 yards beyond where I was baiting so that I couldn’t snag it with a hooked fish. This enabled me to bait up in the same spot every time and I would have a casting marker whenever I decided to fish. Of course, the temptation to fish the spot is immense so one evening when I was heading out to bait up, I took a rod with me, just to see if fish were visiting the area. I baited up, chucked out and sank the line. I didn’t have to wait long before the tip pulled slowly round and I was into hybrid number one. These hybrids are heart stopping at first because you think you’ve caught a huge roach, but more of that later. I fished for 40 minutes just to check it wasn’t a fluke and then left the swim to cook. Next morning, Shane arrived. 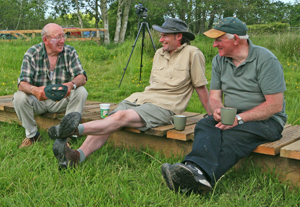 I told him that we’d decided against fishing the Shannon and that we’d probably do better right here on our doorstep. He was fine with that but we endured a really slow start. I caught instantly and then the bites dried up until no-one was getting any indications whatsoever. Shane explained the Shannon system has become infested with zebra mussels resulting in the water going very clear. The fish are still there but now they tend to feed early and late. The weather was typically Irish, very windy with a few showers, but the beauty of Irish weather is, if you don’t like it just wait half an hour and it will change to something else. Frustrated by the lack of action we decided to rest the swim and head back to the cottage for a warm bowl of soup. An hour or so later we returned to the very same swims, warm and fortified. Blow me, I had a bite first cast. I turned to tell Shane and spotted his rod was hooped over too. After all that time with no action we weren both playing a fish at the same time. From then on it was as if the fishing Gods had thrown a switch and we were getting a bite every cast from the most fabulous looking hybrids imaginable. They were immaculate specimens ranging between two-and-a-half and 3lbs, maybe the occasional one would go a bit heavier but for all the world they looked and fought like big roach, except I’d say these kiddies fight a good deal harder. I think you can count 17 big hybrids laid out on my unhooking mat. There were as many again in my keepnet and we didn’t select the biggest or the prettiest, these were just a random sample and what you see is pretty much what I caught in the space of a single hour. It was mental fishing and I kept wondering to myself what folk are on about when they say that Ireland’s finished and the fishing isn’t what it used to be. Have they actually been? Or maybe they prefer to sit in a pub instead of fishing when the fish have got their heads down. I love a glass of the black stuff myself but it’s not conducive to rising at dawn, is it? By all accounts we were unlucky with our timing. 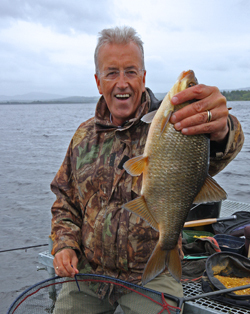 There are some absolutely huge roach in Lough’ Derg but the population disappears into side streams and who knows where to spawn in late May, but when they’re around they can run to eye-popping proportions. Two-pounders are not uncommon and two different people swore to me they had previously caught fish over 3lbs. I certainly couldn’t argue with the photographs they showed me. 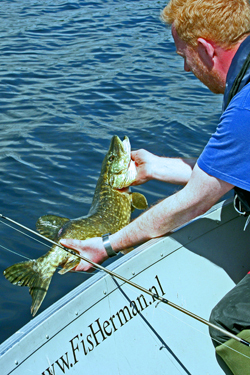 The following day Shane had laid on a spot of pike fishing with Herman Molenaar. Herman is, as you might guess from his name, Dutch, and came to Ireland for a holiday. He loved the Lough and the fishing so much he now resides there permanently. Herman’s a pike nut. 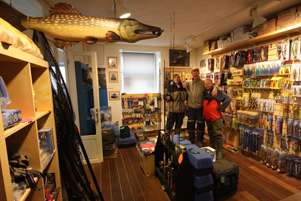 He lives, sleeps and breathes pike, so much so he attracts pike anglers from all over Europe to his guest house which is above the specialist pike tackle shop that he owns on Killaloe’s Main Street. 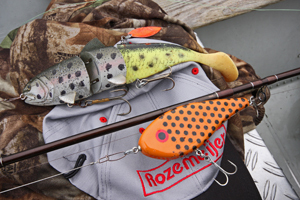 Inspired by his great friend Bertus Rozemeijer, Herman fishes exclusively with lures. ‘My lure season starts on January 1st and ends on December 31st!’ He told me. I was so looking forward to this day. On average his clients catch something like ten fish a day. Sometimes, when the pike are on the rampage it can be many, many more. 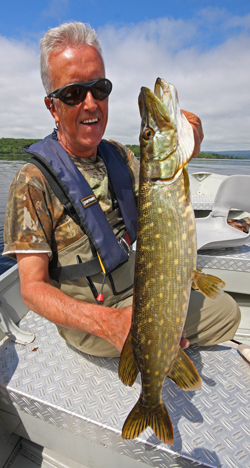 His best lure caught pike from Derg is 36lb but he recently lost one that was much bigger, right at the boat. I do not doubt him. 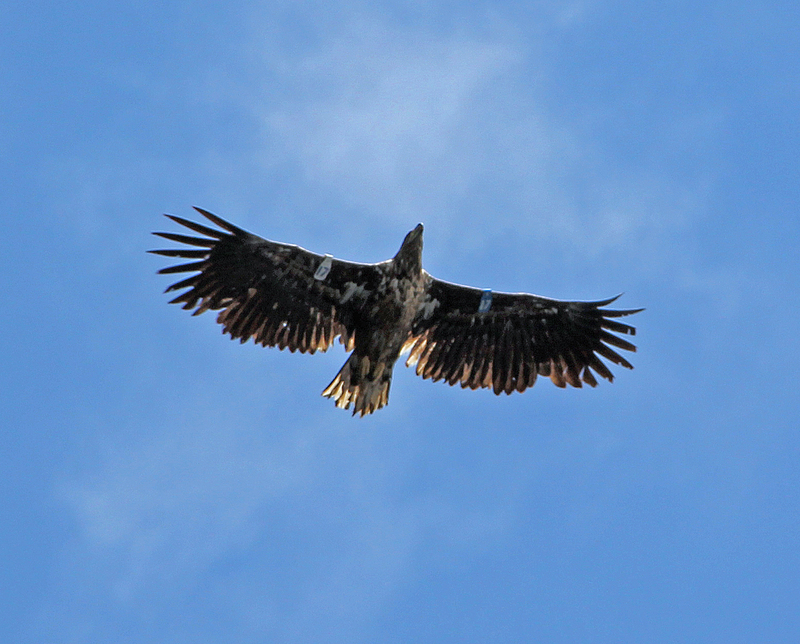 He knows the Lough inside out – every bay, island, inlet and even where to find the rare fish eagle that he pointed out to me. ‘It arrived a year ago. It has a nest over there…’ Gesturing towards a densely wooded hillside. Alas we ran into the worst weather imaginable for pike fishing. The clouds ran away, the sky turned Mediterranean blue, the sun beat down and temperatures soared. But worst of all, the Lough dropped calm. Now we’ve all seen mirror-like lake surfaces but it takes pretty special conditions for 32,000 acres to go completely flat in the middle of the day. And then burst into howls of laughter. It was that kind of day. 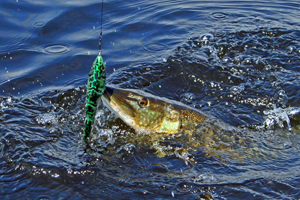 The aim was to fish with jerk baits in the many bays and inlets and around islands and drop-offs. In between spots we would troll lures. 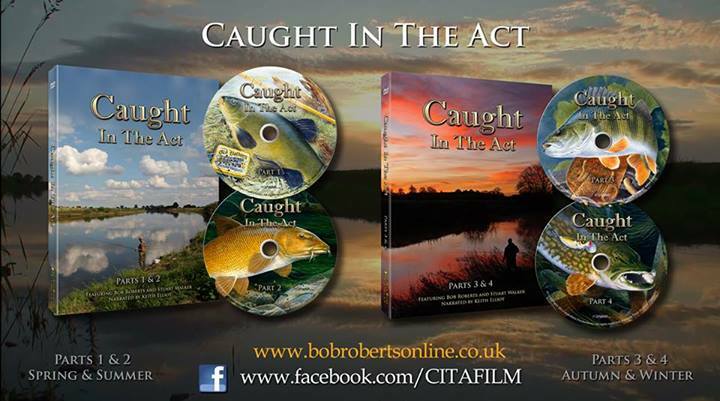 My favourite, and the only one to produce any action that day, was a trout imitation that was so lifelike that I’m sure it would have taken a worm if you dropped one in front of it. But we mixed and matched with everything from giant bulldawgs to plugs but it was all to no avail. This was simply the wrong day for piking but we didn’t fail for the lack of trying. Thankfully the ‘old’ Dutch master managed to winkle out a small one for me while we trolled between jerk baiting spots. Meanwhile John and Shane had shared a boat with Herman’s more than able assistant, Otto, and John had caught his first ever pike. In fact it was the first he’d ever seen in his life so despite the dire conditions, John was on cloud nine. 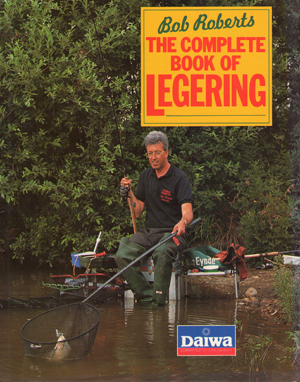 I really must take up Herman’s kind offer to fish in Holland next January where we will jig for zander. Sounds cold, but great fun. For my final day’s fishing I’d arranged to hook up with Feakle guest house owner Mike Daly and Tim Queally, Chairman of the Tulla and District Coarse Angling Association. We fished a small Lake in the East Clare Lake District, which is little more than 20 minutes away from Derg’s shore. Unfortunately the heat wave raised itself up another notch. Bright sunshine and scorching heat do not make for great roach fishing although it’s hard to complain when you’re beside such a stunningly beautiful lake. The Tulla club has over 300 members and it’s been going over 50 years. They’ve adopted umpteen lakes in the area yet it dosn’t cost visitors a penny to fish them. They’re open to all-comers. The members just keep an eye on things and try to ensure there’s no litter or damage. They’re mighty friendly, too. Well, I did catch roach. In fact I was catching one every drop in the early stages, but mostly small fish on double maggot. The better fish are normally caught on corn but I couldn’t raise a bite on the stuff. To be honest I was simply glad to be catching. And then two feet of elastic popped out of the end of the pole as a sizable roach decided to set my knees shaking. ‘Come on, don’t you dare fall off!’ I was thinking. ‘That’s the sort of fish we catch loads of normally. Can’t you stay until this evening? I’m sure they’ll come on.’ Implored Mike. But that was out of the question. We had a table booked at a top restaurant in Mountshannon and a late finish simply wasn’t an option. 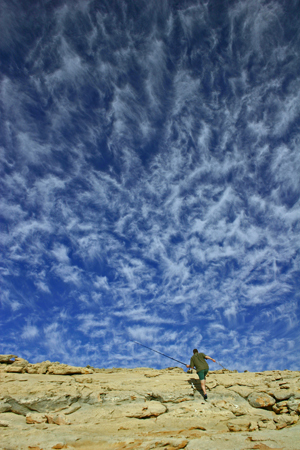 It’s certainly an enchanting area and the same old routine of baiting up a swim over several days was sure to pay off. It’s worth contacting the local fishing club though as they know the lakes really well. 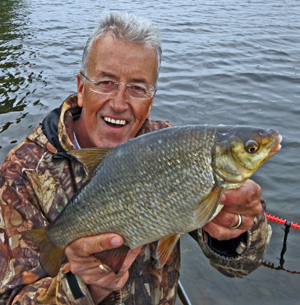 Apparently some are stuffed full of tench, some are good bream waters and some offer fine roach sport. 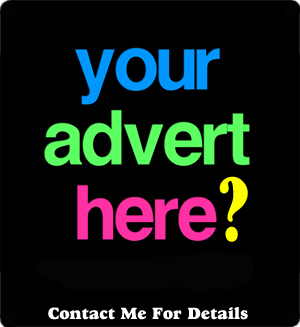 Contact the Tulla and District Coarse Anglers Association through their web site or Facebook page (below). Sadly that’s where my trip had to end. Four very different days fishing but each one a real treat. The people were absolutely fabulous, genuine and helpful. Ireland is like stepping back in time. Empty roads, totally litter free, friendly and welcoming. 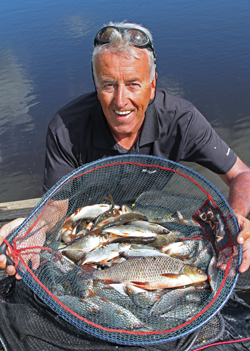 Best of all, the fishing can still be sensational providing you adapt to the changes. And I’ll sing its praises from the rooftops because, you know what? I can’t wait to go back again. Roll on next year. If you do fancy a trip to the Emerald Isle then make sure the first thing you do is contact Shane O’Reilly. Shane has a list of contacts as long as your arm and it doesn’t matter whether you’re wanting to catch pike, bream, roach, rudd, or even trout and salmon. Shane will steer you to the exact people and places you need. 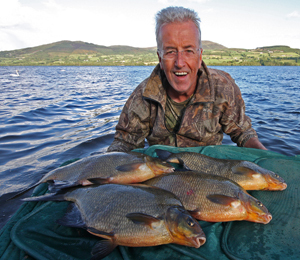 He has a real passion for Irish fishing and will do everything he can to help. It’s dead easy to get to Ireland. I travelled over from Holyhead on the Stena Line Ferry but you can get there from South Wales or Scotland if that’s nearer to you. But What About My Better Half…? Many anglers tell me they would like to try fishing in Ireland but they worry about what there might be for their wives to do. Well, with this in mind, I contacted Aoife Finnegan at Tourism Ireland and she came up with a suggested 3-day sight seeing itinery for the Co. Clare area. The Burren Region, is a 100 sq. mile are of limestone rock, often referred to as Europe’s largest rock garden. Rare plants from the arctic and Mediterranean grow side by side in the cervices of the rock. Wild orchids grow there in May and June. The enigmatic Burren is a paradise for archaeologists, historians, hikers, artists, and writers. The Burren Way walk, a 20-mile walking trail takes hikers across country lanes, rocky hill‑paths and ‘Green Roads’ where they can enjoy the remarkable lunar landscape of the Burren. Visit The Burren Centre, Kilfenora, Co. Clare. It introduces you to one of the most enigmatic areas in the world – the Burren District. Models, displays and audio-visuals reveal the mysteries and complexities of this unique area. Visitors can explore the geology and geography of the areas, including the rich diversity of Burren flora and fauna and the history of man in his landscape. Visit The Burren Perfumery and Floral Centre, Carron, County Clare. Tel: +353 65 7089102. Established over 30 years and located in one of the most unique floral landscapes in the world. The perfumery pproduces a high quality range of natural aromatherapy products and fragrances where the ingredients are sourced from the local landscape. Visit the Burren Smokehouse, Lisdoonvarna, County Clare for a tasting of rich smoked salmon and learn how it is smoked. Visit Poulnabrone Stone Tomb. This dramatic site, on the karstic limestone pavement of the Burren, is one of the most famous Irish dolmens. The name Poulnabrone literally means ‘The hole of the sorrows’. Visit the Aillwee Caves in the heart of the Burren. The caves withits stalagmites, relics of bears, and waterfall, lies beneath the Burren. Visitors can travel through beautiful caverns, and over bridged chasms. From there you can go on to the picturesque fishing village of Ballyvaughan with a suggested lunch stop at Monks Pub in Ballyvaughan (Tel: 065-7077059). You may then drive via the coast road through Blackhead, passing the golden strands of Fanore Beach and on to the Cliffs Of Moher. These spectacular MoherCliffs rise 700 ft abovesea level and stretch for five miles. They make for a breathtaking experience – bird watchers come here to study the Puffins. O’ Brien’s viewing tower was built at the top of the cliffs in 1835 and offers spectacular views of the three Aran Islands. During the summer season visitors can enjoy a boat tours of the Cliff base. Weather Permitting you might take in an alternative view of the Cliffs of Moher from sea level on board a Moher Cruise operating from Doolin Harbour. You may also care to drive to Doolin Village – perhaps the best-known location for traditional Irish music. There are several good pubs that feature music 7 nights a week (McDermotts, O Connors, McGanns) plus many cafes and restaurants, catering for every taste and budget. The small harbour is the nearest port to the Aran Islands, and a ferry runs to Inisheer and Inismore daily from April through to September. Depart For Kilrush, Co. Clare, taking in the scenic Shannon Estuary drive to Kilrush, passing through the harbour villages of Killdysert, Labasheeda and Kilimer. Kilrush, is the capital of West Clare. It was planned and owned by the Vandeleur family in the 18th century. In its heyday, during the late nineteenth century Kilrush was a busy trading post. Today it is a pleasant market town on the Shannon Estuary, with an excellent modern marina and a variety of maritime activities and visitor attractions. Opportunity to go on a Dolphin watching trip or visit the nearby historic Scattery Island. Ferries depart from Kilrush Creek Marina. Tel: 065 9051327 for departure times. From Kilrush take the scenic driving route to Loop Head. This is one of the most remote and wonderful places in Ireland. Not many miles from the some of the top resorts, it remains a place to itself, protecting the waters of the Shannon Estuary from the open ocean. A whitewashed lighthouse stands in an enclosure at the tip of the head, but there are no shops, no signposts, nothing but birds and wild flowers, cliffs, and the Atlantic surf. Drive to the popular seaside resort of Kilkee. Kilkee is situated on the Atlantic Coast facing a scenic, semi-circular sweep of sand that slopes very gently into the bay. This charming seaside town has been attracting people to its shores for the last two centuries. Kilkee has a well deserved reputation as one of the safest bathing places in Ireland and the beach has regularly been awarded the “Blue Flag” by the E.U in recognition of clear unpolluted waters. Drive along the coast road to Lahinch. This is a friendly seaside resort and is a Mecca for golfers, having two18 hole links golf courses. Throughout the year the high surf in Lahinch attracts surfers from all over the world. En route to Ennis stop at Ennistymon. This is a charming country town that has many unchanged traditional and colourful shopfronts. The town is hilly and the streets are narrow, well suited to a stroll. A small river, the Inagh, runs by the town and descends by means of some small waterfalls, known locally as ‘the falls’ or ‘the cascades’. The best places to view these are from the road bridge and, better still, from the bar of The Falls Hotel a short walk off the main street. This large lounge bar is constructed high above a large pool into which the river descends; the view is always worthwhile but particularly when there is a flood in the river. Visit 13th century Franciscan Friary in Ennis town. The Friary was founded by the O’Briens, it has numerous 15th /16th century sculptures carved in the local hard limestone. Ennis town is rich in character, with narrow streetscapes, quaint shops and shopfronts, pedestrianised streets, numerous monuments and buildings. Visit Craggaunowen – The Living Past, near Quin. Tel: 061 360788. Hear the story of how the ancient Celts lived, fought, farmed, hunted and died. The changes they brought to the social organisation of the tribes, their dwellings and hunting methods are explained by the animators in character set in the time period. Craggaunowen has many stories to weave as we move from the Crannog (Lake dwelling) to the Ring Fort which was still in use when the Normans started building stone castles, a technology adopted by the Irish Celts. Visit Dromoland Castle, Newmarket –On –Fergus. Tel: 061 368144. This is one of Ireland’s finest castle hotels, offering guests the experience of living like landed gentry, surrounded by luxury and beauty. Dromoland is one of the few Estates tracing its history to native Gaelic Irish families of royal heritage. The castle, a magnificent Renaissance structure built in the 16th century, was once the royal seat of the O’Brien clan, direct descendants of Irish King Brian Boru. Refurbished and transformed into a luxury hotel in 1962, it retains priceless reminders of the Castle’s historic past. Splendid woodcarvings and stone statuary, hand-carved panelling, brilliant oil paintings, romantic gardens and fine antique furnishings surround guests during their stay. Visit Bunratty Castle and Folk Park. Tel 061 360788. The MacNamara Clan built Bunratty Castle in 1425. The history of this beautiful building stretches over 500 years of turbulence. Inside the walls the Great Hall holds a very fine collection of 14th to 18th century furniture, paintings, and wall hangings. The world famous Bunratty Medieval Banquet, held twice nightly in the Castle, is a testament to the culture and social life of its former inhabitants. The Folk Park adjoins the castle and aims to show what everyday life was like in rural Ireland about 100 years ago. It contains reconstructed farmhouses, cottages and shops, and care has been taken to make them as authentic as possible, particularly with regard to furnishings. The Park is a living museum: animals are tended, bread is baked, milk is churned, walls are whitewashed and roofs are thatched. You may visit an Irish farmhouse, watch the blacksmith fit a horseshoe, attend a weaving demonstration, and bake and eat scones at the local teahouse. For the ultimate pampering experience in the Shannon region this is the place. A 5 star Castle which has hosted US Presidents and royalty alike. Lahinch Golf and Leisure Hotel, Lahinch, County Clare. Tel: +353 65 708 1100. Play the renowned Lahinch course followed by a leisurely stay in this 4 star hotel. Doonbeg Golf Club and Lodges, Doonbeg. Another top class resort which offers a wonderful golfing and leisurely experience. I’m indebted to Aoife Finnegan for her help and guidance in compiling the 3-day tourism itinery. It’s a whole lot to pack in if that’s what you fancy. Perhaps you could entice the better half to stay a fortnight? You’d certainly fill your boots with fish if you did! And If That’s Not Enough…! 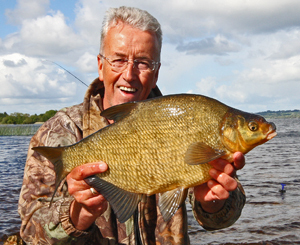 This entry was posted in Foreign Travel and tagged Bertus Rozmeijer, Bream, East Clare Lake District, Fishing in Ireland, Herman Molenaar, hybrids, Killaloe, Lorraine Tully, Lough Derg, Mike Daly, pike, River Shannon, roach, Tench, TJ O'Brien, Trolling, Tulla And District Coarse Anglers by Bob. Bookmark the permalink.